Poland’s Senate on Saturday approved long-promised reforms to the country’s judicial system which have been fiercely opposed by Brussels and left wing protesters. To become law, the populist ruling Law and Justice (PiS) party’s draft bill for reforms — which would give parliament greater power to dismiss activist judges, and add a responsibility to consider the nation’s Christian values when passing judgements — now only has to be signed by the president, Andrzej Duda. The government contends that the measures are necessary to reform a Communist-era model which still harbours many judges from that time, and polls show that a majority of Poles believe the country needs judicial reform. On Thursday, as Poland’s lower legislative house voted through the reforms, tens of thousands of anti-government protesters gathered in cities across Poland —many wielding European Union (EU) flags — chanting, blocking roads, and in one case even attacked a member of parliament. 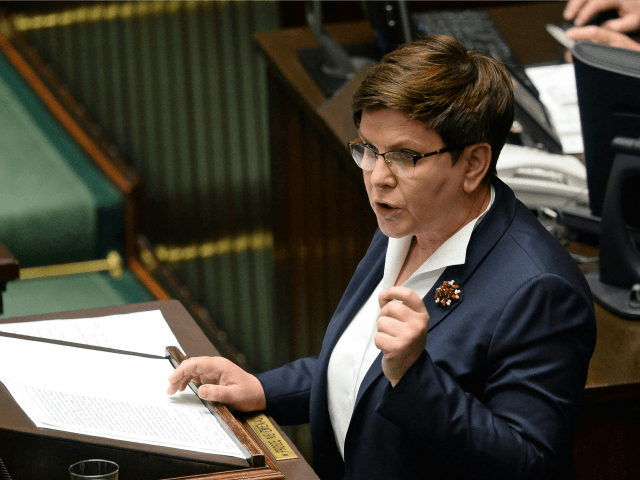 In addition to the protests — which have been covered widely and sympathetically by the West’s liberal media — Poland’s government has had to contend with warnings from Brussels over the reforms. Breitbart London has previously reported on how the EU threatened has threatened to suspend the nation’s voting rights in the bloc if it continued with the reforms, and senior officials in Brussels have even suggested cutting off funding to Poland. The Polish government received messages of solidarity on Saturday from Hungary, which has also been threatened by the EU for resisting a compulsory migrant quotas scheme, and for launching a domestic reforms programme aimed at improving the financial transparency of NGOs backed by overseas actors such as billionaire open borders campaigner George Soros. “The inquisition offensive against Poland can never succeed because Hungary will use all legal options in the European Union to show solidarity with the Poles, said Hungarian premier Viktor Orbán, speaking in Romania. Calling for “patriotic governance” against the EU, he said Poland was a victim of harassment from Brussels, and asserted that prominent politicians in the bloc were out of touch with the public on issues such as migration — which Orbán stated is the most important issue facing Europe. “Will Europe be inhabited by Europeans? Will Hungary be inhabited by Hungarians, Germany by Germans, France by the French, Italy by Italians? Who will live in Europe?” he asked the gathering of conservative leaders at Baile Tusnad.